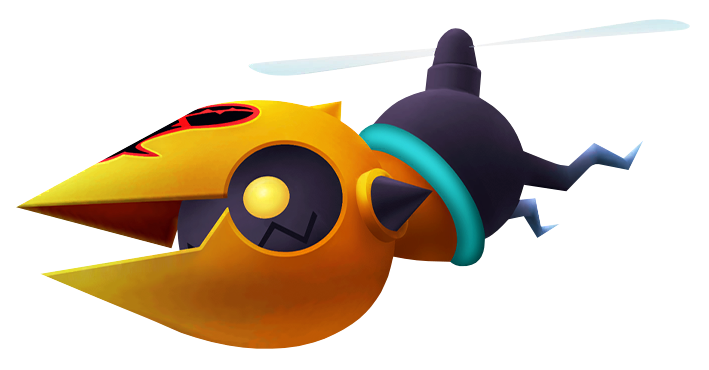 The Rapid Thruster is an Emblem Heartless that is found in Kingdom Hearts II. Rapid Thrusters never appear alone. They are always accompanied by other Rapid Thrusters, be it two or one hundred. Rapid Thrusters make up a great percentage of Shan-Yu's army in The Land of Dragons. While fighting a disguised Riku at The Land of Dragons, an endless swarm of Rapid Thrusters hover above the battleground. A Rapid Thruster has a spherical, black head with glowing, yellow eyes and a jagged mouth. Its head is surrounded by a large, two-pronged, beak-like helmet that sports a black spike on either of its sides. The helmet itself is orange and the Heartless emblem is on its top. Its body is also spherical, black, and only slightly larger than its head. It lack arms, and its legs are thin and do not have distinct digits. It has a propeller attached to its rear that it uses to fly. Its neck and body are separated by a thin, cyan line. The Rapid Thruster's name refers to its speed—hence, "rapid"—and the propeller on its back—a "thruster" is a propulsion device. In the Pride Lands, there is an area above The King's Den called the Peak (the place where Scar is fought), where countless numbers of Rapid Thrusters can be fought. This area is an excellent spot for Sora to acquire multiple Lightning Shards, which are dropped by the Rapid Thrusters. If trying to acquire extra experience, it is recommended to equip the Gull Wing Keyblade, equip Experience Boost ability, go down to the critical health point, and then battle the Heartless, as doing so will provide even more EXP. However, this does not work in the Final Mix version, where there is instead only a single Rapid Thruster at the Peak.